2016-04-11 It is sunny today and about 45 with a some gusty wind. So I decided to take my new simple cat food stove and my Fancee Feest and compare how they do with the new IMUSA R200-12W Aluminum Mug 1.25 Quart that came today in the mail From Goodmans. Both tests were done with 2 cups of tap water and within about half an hour of each other so the conditions were pretty identical. 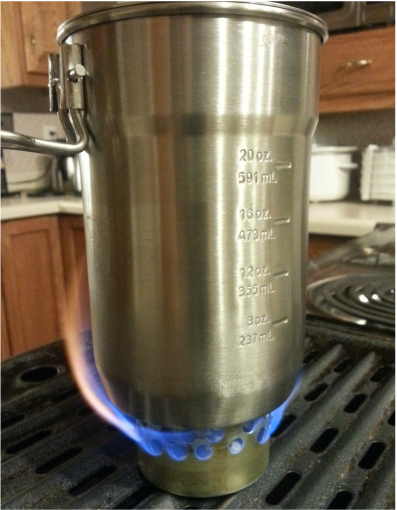 I put one ounce of denatured alcohol in each stove. I didn't take a photo of the Fancee Feest but the one at right of the simple stove is identical to how I had the Fancee Feest set up. The simple stove setup didn't quite make it to a full rolling boil before the alcohol ran out right at 8:00 minutes. The Fancee Feest produced a rolling boil in 8:00 minutes and kept on burning (and boiling) for another 2-1/2 minutes for a total of 11-1/2 minutes. Clearly under these somewhat more realistic conditions the Fancee Feest did quite a bit better. Perhaps the increased flame protection provided by that inner liner as well as fuel feeding by the wick makes the difference. I don't know but I'm now leaning toward the Fancee Feest as the most reliable option. 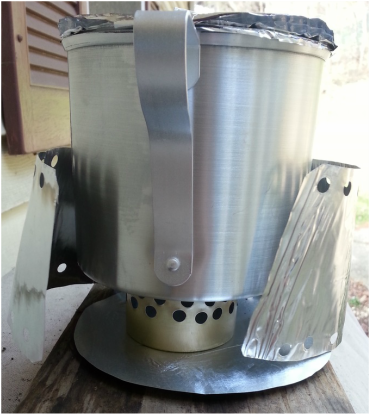 2016-04-09 What is with cat food cans and alcohol stoves? I thought when I came across the Fancee Feest stove I had found the ultimate. Then I saw this thing on a couple YouTube Videos. I started to make my own version of the Fancee Feest months ago. I had the cat food can, had dispensed with the cat food but never found the right can to make the inner liner or the stuff for the wick. So it has been kicked around on my bench since. Too good to throw away but not interested enough to do anything with it. 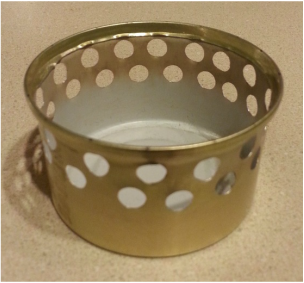 Ultra simple alcohol stove made with a paper punch. 32 holes. You can see the results in the two photos. It took 6:30 to bring the two cups of cold tap water to a rolling boil. That is almost identical to the Fancee Feest. I didn't carefully measure the amount of alcohol but it was about 3/4 of an ounce I think. Again, about like the Fancee Feest. A look at how it burns under my 4-1/2 inch aluminum one quart pot. 6:30 to a rolling boil. A bit less than an ounce of fuel. 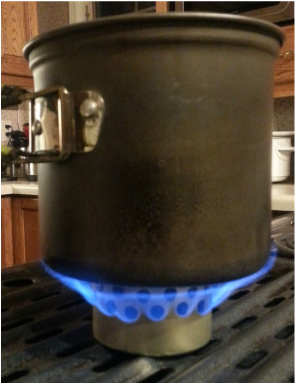 The stove burning under my 3-1/2 inch Stanley cook pot. 8:30 to a rolling boil boil. About an ounce of fuel. ​I feel a bit "funny" about simply setting a "cup" of alcohol on fire with no wick or special design or anything. But it clearly works and about the same as the Fancee Feest and somewhat more efficiently than the Alcos stove. One question I still have is how it would work on my much smaller diameter Stanley Pot. So I'll check that next. Regardless, its been a fun 45 minute project! The photo to the left shows the Stanley pot on the new stove. Result? nearly identical to the Fancee Feest again. It took 7:30 to bring the 2 cups of cold tap water to a rolling boil, same as with the Fancee Feest. And, as with the Fancee Feest it took a bit more fuel, probably close to an ounce. But it works fine with the smaller diameter Stanley pot. So looks to me like the pot is what makes the difference. I guess if weight is a factor then this new one wins. It weighs 75% less than the Fencee Feest at 0.2 ounces instead of 0.8 ounces! My conclusion? It's a toss up between the Fancee Feest or this one. I am fascinated by this ultra simple design.